With the advent of the Egyptian presidential elections, the regime has embarked on a systematic process of eliminating possible candidates who could run against President Sisi. The process started with Ahmed Konsowa, an army major who declared his intention to run in a YouTube Video. His announcement led to his arrest and six year imprisonment for violating military regulations and for attempting run while in active service. Konsowa had tried to resign on several occasions previously, only for his resignation to be rejected. More prominent figures include Ahmed Shafik, the last Prime Minister of the Mubarak era and an ex-air force general, and Sami Anan, a former military chief. Upon announcing his intention to run, Shafik was promptly deported from the UAE and placed under house arrest. He later declared his withdrawal from the race. Anan, on the other hand, was arrested on the 23 January 2018 after a brief statement issued by the Supreme Council of the Armed Forces (SCAF) accusing him of violating military rules, and attempting to create a rift between the people and the military. Ironically, Anan had previously been a member of SCAF. This prompted Khaled Ali, the prominent human rights lawyer, and last real contender, to pull out of the race on the 24 January. It is important to note that he was facing possible disqualification due to a court verdict, currently under appeal, for an obscene gesture during a protest. On 26 January, El-Wafd Party, one of the Mubarak era parties with close links to the regime, declared that its head, El Sayed El Badawi, would run as its candidate in the presidential elections, in an attempt to keep the multi-candidate nature of the election intact. Interestingly, the party had only declared its support for Sisi 48 hours prior to the declaration. The decision to run was justified as protection for the state, and the need to show political plurality. El Badawi was later forced to withdraw after internal resistance within the party. This forced the regime to call on another candidate, the head of the Ghad Party, Mousa Mostafa Mousa, who is a known supporter of the President. Mousa submitted the needed paper work seven minutes before the announced deadline. In response to this, the Civil Democratic Movement, a new loose coalition of opposition figures has called for an election boycott. A call that prompted a furious response from the regime, with Sisi issuing thinly veiled threats of violence against the opposition and any attempts of mass protests, similar to the events of 2011. The policy followed by the regime has turned the electoral process into a de-facto referendum rather than an election and it will have grave consequences for both the regime and the opposition. This development has regressed the Egyptian political system to the 2005 Presidential elections, the last and only presidential election of the Mubarak era that allowed multiple candidates to run, which was arguably even more competitive that the current election. A clear message is being sent to the opposition still hoping to work legally within the system to bring about reform: the possibility of internal reform is futile. The opposition is being denied any attempts to contest elections and forced into direct street action. It is not the first time that the ramifications of working within the system are equated with illegal acts of opposition. The regime has already embarked on a campaign of repression against the opposition, where a number of secular party members were arrested for various charges, the most prominent of which include insulting the president, affiliation with an outlawed group – a thinly veiled reference to the Muslim Brotherhood – and attempting to overthrow the regime. The most prominent case that provoked considerable outrage within the opposition is the case of Islam Maraei, the secretary general of the Social Democratic Party, who was arrested from his home on the 15 June 2017 and sentenced to three years on similar charges. By following this policy, the regime has not only closed public space, but de-incentivized the process of legal political participation, since the costs involved do not differ much from illegal protests and strikes outlawed under the notorious protest law. In essence, the strategy of the regime has shifted from the co-option of secular opposition, in an alliance against the Muslim Brotherhood, into direct repression. 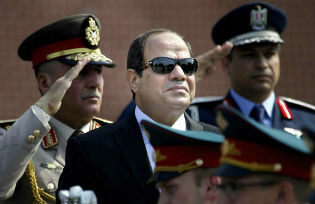 A process that has been ongoing since Sisi came to power, reaching its apex with the regression of the electoral process to a de-facto presidential referendum. The consequences for the regime are also significant. Due to the blatant manipulation of the electoral process, any semblance of legitimacy derived from the electoral process is bound to evaporate. This will place the regime in a more precarious positon, since its sole source of legitimacy is anchored in its ability to secure the country and develop the economy. However, considering the worsening security and economic situation, with more devastating terror attacks and increased economic hardships, one would expect increased discontent amongst the populace. This is also combined with the fact that the regime, unlike its predecessor, has failed to build a mass civilian party to act as a stabilising pillar. The regime has systematically alienated the civilian elites and business community, previous pillars of the Mubarak regime, as well as the security establishment and the judiciary. It has chosen instead to rely on a loose affiliation of independents for support in parliament in an informal coalition called Tahya Masr with no formal party structure. The military has aggressively expanded its economic activity in a manner that has affected the ability of the private sector to compete. In terms of opposition within the security agencies, there have been a number of embarrassing leaks of recorded phone conversations, the latest of which shows the attempts by regime officials to manipulate public opinion to accept the move of the Israeli capital to Jerusalem. This was immediately followed by the removal of the head of the General Intelligence Agency (GIA) to be replaced with Abass Kamel, Sisi’s Chief-of-Staff, on a temporary basis. Fuelling speculation that the latest leaks were part of the power struggle between Sisi and the powerful GIA. There was also stiff opposition within the judiciary, which manifested itself in the case of the transfer of the two Red Sea islands, Tiran and Sanafir, from Egyptian to Saudi sovereignty. There are also some cases of opposition within the state apparatus, the most notable of which is the case of Hesham Geneina, the former head of the Central Auditing Agency, who released statements regarding corruption within Egypt’s state institutions. This allegation led to his dismissal as well as a suspended jail sentence of one year for spreading false news. It is worth mentioning that Sami Anan had mentioned that he would have selected Geneina as his deputy, occupying the positon of Vice President, had he won. Geneina was attacked after the arrest of Anan in what appears to be a fabricated traffic incident, and was detained in the police station for 4 hours, while injured, under the pretext of completing the investigation. By transforming the election into a de-facto referendum, the regime has removed the last fig leaf of claimed legitimacy. This move is bound to push the legal opposition away from working within the system to working outside it. In an attempt to centralize power, the regime is in the process of creating one unified enemy, an alliance between the disgruntled security and civilian elites as well as the opposition. If unified, they will be hard to tame.